When it comes to auto service, many consumers are diligent about maintaining their vehicles’ engine oil, tire pressure, brake fluid, etc. But, how many of you actually take the time to properly maintain your car’s paint? I bet only a fraction of you raised your hands, which is understandable. Since not all of us have shiny new vehicles, not all of us might feel the need to go pursue additional upkeep on a used model, depending on its age. After all, there could already be dents, dings, scratches, gouges, blemishes or any other type of paint damage you can think of. Therefore, why bother? Well, if you have a new car, there is a four-step process you should follow. The rule of thumb is wash, clean, polish and wax to keep that new car shine for years to come. First and foremost, you spent a lot of money on the car. Especially if you decided to buy a higher-end luxury model. But, even if you’re driving a basic economy sedan, you still want to attract eyes on the road. The best way to do that? Keeping a sheen on that paint. Plus, it’s a very underrated part of the auto-care experience and also provides health benefits for your vehicle as well. Primarily, your vehicle’s paint combats rust. That shiny surface isn’t just to make your vehicle look good. No, it does much more than that. There is actually a protective element to that layer of paint atop the metal body. What happens to metal when it’s exposed to the elements? It rusts and if you don’t properly maintain that paint — in turn, maintaining that protective coat — then you risk seeing rust spots popping up prematurely in your vehicle’s life. Now, if you spent all that money on a car, my guess is you don’t want to deal with premature rust spots. Could you just run it through an automatic car wash? Sure, but why do that when you can spend time with your kids or significant other on a warm, sunny day and wash the car together? You can actually damage the protective coating if you don’t wash it properly, which means you’ll want to ensure you’re doing it right yourself as well. You’ll start by washing the car, which is also the most important of the four steps. Why? Because, it removes the loose contaminants that slowly accumulate on the surface of the paint finish over time. These contaminants eventually cause scratches in the polish and waxing process if not removed first. Those scratches wear down the finish, and risk damaging the paint by exposing it to the elements; hence, the surface rust problem. When washing, make sure you use a proper cleansing product. No, don’t just go grab the closest bottle of Dove, Soft Soap, or whatever other cleaning product you have lying around the house. 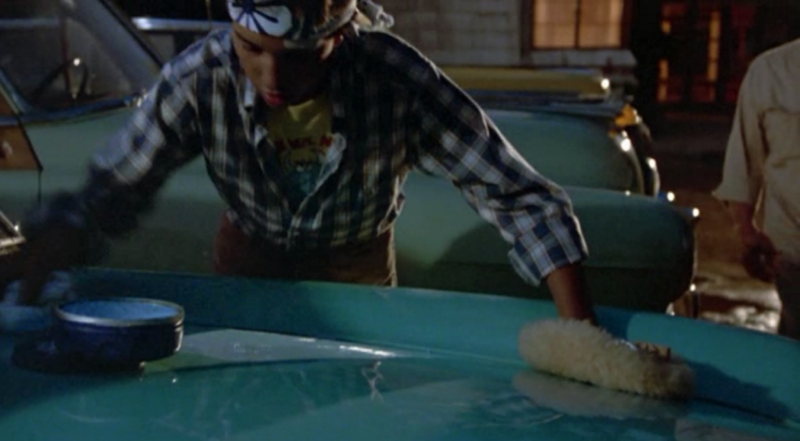 You’ll want something like Turtle Wax, which is a reputable car-care product. The reason? Products like this are pH-balanced. Formulated to safely loosen and lift those contaminants off the surface, without stripping away waxes or damaging the finish. Using a microfiber towel, start at the top of the car and wash down using small, circular, overlapping strokes. Microfiber towels are great because they draw and trap the dirt particles out and away from the paint, as opposed to a regular towel, where you would end up just dragging them along the surface. After you’ve washed the whole car (wax-on, wax-off, young apprentice) you’ll want to use a waffle-weave microfiber drying towel. Wash your vehicle this way on a weekly basis for optimal results. Now that you’ve removed all the loose contaminants, it’s time to look for any surface-bonded ones, like tree sap, bird droppings, or pollen. You’ll also want to keep an eye out for below-the-surface problems, like swirls, oxidation caused by ultraviolet radiation (thanks, sun), or etching from any acid rain. A good way to check for the above-the-surface contaminants is by running your hand across the surface itself. If it’s not like running your hand down a freshly-cleaned window, then you need to clean it. Grab a clay bar that’s been designed for car care. Its mildly abrasive nature effectively removes these contaminants. Rub it over the tree sap or bird droppings in a kneading motion. Don’t keep using the same dirty area, either. Turn to a clean section of the bar when necessary. When it comes to the contaminants found under the finish, you’ll want to use a cleaner that has mild abrasives in it. Use a foam or microfiber applicator pad, and apply the product using small circular motions. No hard pressure is needed. If no defects are detected, skip this step and proceed straight to polishing. A lot of people mix this up, so I’ll clarify: polishing does not protect the finish. It adds that dazzling new-car gleam that everyone so desperately craves and covets. Waxing is what protects that sheen, finish, and paint. Again, you’ll want the proper car-care product for this. With the right polish, you’ll restore natural oils to the paint that might have been lost or minimized over time. These oils are what add that reflective gleam. On darker colors, the restored sheen will stick out like a sore thumb. Lighter colors? Not so much. But, you’ll still notice it. Just like washing and cleaning, apply the polishing product by hand with a microfiber foam applicator with circular, overlapping strokes, one section of the vehicle at a time. After the product becomes hazy, you’ll want to remove it with a microfiber towel. This last step is very important, because if you remove dry polish — when it’s no longer hazy — you will scratch the finish. Once a year is fine for polishing. This is the last of the four steps, and it’s the phase that protects everything you’ve done up to this point. Do this at least every three months with your average wax product. If you want to do it more frequently, there are certain waxes that can be applied more often. Synthetic polymer-based waxes are the way to go. They’re longer-lasting, and easier to use in the sun than the older carnauba-based waxes. If the car isn’t exposed to the elements constantly (kept in a garage), protection will last between three to four months with the synthetic waxes. Same technique: small, circular, overlapping strokes, using a microfiber foam applicator pad, and doing one section of the vehicle at the time. Make sure to remove the wax with a microfiber towel that you’ve folded into fourths. This is so you can use one side to break the waxy surface, and then use the other side to remove any lasting residue. That’s the basic, four-step process to protecting your vehicle’s paint for its best impression on the road.